Believer's Baptism Explained gives an overview of what is believer's baptism, why consider baptism, why baptism by immersion, what is the meaning of baptism and why be baptized? Believer's Baptism is explained by two actions. Believe and be baptized. When Peter proclaimed the gospel in Jerusalem on the day of Pentecost, he said, "Repent and be baptized, everyone of you..." (Acts 2:38). "Those who accepted his message were baptized..." (Acts 2:41). When Paul visited Greece, he proclaimed the gospel in Corinth and "many of the Corinthians who heard him believed and were baptized" (Acts 18:8). Believer's Baptism states, first I believe then I am baptized. In other word, believing comes before baptism. We see this same order in the conversion of the Ethiopian (Acts 8:35-38), Cornelius (Acts 10:44-48), Lydia (Acts 16:14-15) and Crispus (Acts 18:8). 1. Jesus Commanded Believer's Baptism. Jesus said to His disciples, "Go therefore and make disciples...baptizing them in the name of the Father and of the Son and of the Holy Spirit..." (Matthew 28:18-20). 2. Believer's Baptism Has Significance For Our Lives. Believer's Baptism is a time when we say publicly that we have repented of our sin, we have turned to faith in Jesus Christ and we totally surrender our lives to God. In other words, believer's baptism is an outward sign of an inward experience. 1. The Early Church Practiced Immersion. The English word 'baptism' comes from the Greek word 'baptizo'. Greek scholars agree that 'baptizo' implies 'to dip under' or 'immerse'. When John baptized Jesus in the Jordan river, we read in Mark 8 that Jesus came up immediately out of the water. "As Jesus was coming up out of the water..." (Mark 1:8-9). The biblical meaning of believer's baptism can only be properly explained when we view baptism by immersion. See diagram above! 1. Baptism identifies the believer with the death, burial and resurrection of Jesus Christ. 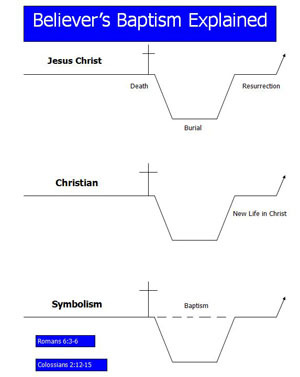 Romans 6:4 says, "Therefore we were buried with Him through baptism into death, that just as Christ was raised from the dead by the glory of the Father, even so we also should walk in newness of life" (See believer's baptism diagram above). 2. When the believer is going down under the water, he or she is publicly renouncing the sinful core of their being. As Romans 6:11 says, "Reckon yourselves to be dead indeed to sin..."
3. When the believer comes out of the water, he or she acknowledges the new life that God gave them when they became believers. The Bible says, "Just as Christ was raised from the dead by the glory of the Father, Even so we should also walk in newness of life" (Romans 6:4b). 4. When the believer leaves the water, he or she acknowledge their intention to live by the beliefs and values of God's Kingdom. Colossians 3:1-3 say, "If then you were raised with Christ, se3ek those things which are above, where Christ is, sitting at the right hand of God. Set your mind on things above, not on things on the earth. For you died, and your life is hidden with Christ in God." 5. When the believer leaves his or her baptism, he or she give themselves to the mission and ministry of Jesus. Romans 6:13 says, "Give yourselves to God, as those who have been brought from death to life, and surrender your whole being to Him to be used for righteous purposes." 1. To show obedience to the Lord (1 John 5:3). 2. To please God (1 John 3:22). 4. To declare God's way of salvation (1 Corinthians 15:1-4). 5. To demonstrate the believer's changed life (2 Corinthians 5:17). In conclusion, believer's baptism is an outward symbol of an inward experience. The resource below may help you consider the child's request to be baptized.